No entry in Soane office Day Book but attributed to Henry Hake Seward, pupil and assistant May 1794 - September 1808. In the survey drawing  the library is shown as in the north facing wing (that was to be demolished). The design drawings show it in a three-windowed room facing south (,and  or in the south-east room with three windows facing east  and . The drawings for the finishing of the library  and  have it with three windows. 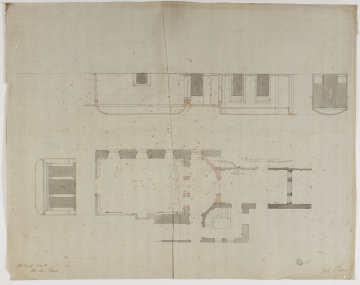 The current plan published in P.Dean, Sir John Soane and the country estate, 1999, p.104, has the library with three windows facing north and forming a central part of the eat-west enfilade arranged by Soane.